Luxury camping site in the sunny Vendee region on France’s beautiful Atlantic coast. Camping Les Genets is a luxury camping site in the sunny Vendee region on France’s beautiful Atlantic coast, close to the resort of St Jean de Monts. To check availability for your luxury camping holiday, contact LUX-camp. Please note: The restaurant on Les Genets will not be open until 1 June due to renovations. The new dome covered swimming pool and the new outdoor slides should be completed by 1 July. Alternatives: Restaurant - The take-away service is open as usual and there is a large selection of restaurants close to the beach, about 800m away (about 10 minutes walk). Pool - The current outdoor pool and slides are not affected and will of course be open from 24 May. This 5-star site offers a range of luxury mobile homes that offer all the comforts of home at a price to suit your budget. Located a short walk from a stunning beach and benefiting from the shade of mature trees, the cottages all have a well-equipped kitchen with everything you need for a comfortable stay. The most popular feature for many visitors is the large waterpark, with indoor and outdoor pools, slides, a lazy river and jacuzzis that will keep both children and adults happy for hours. 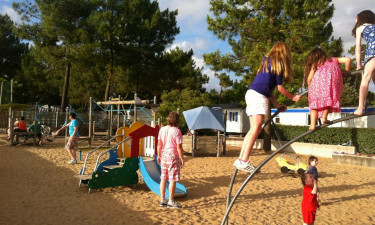 Camping Les Genets is a lively site especially popular with families with children. The aquatic complex is a hive of activity all day long, with its beautiful outdoor pools and waterslides being an attractive feature. The lazy river is a relaxing and exhilarating for all the family and the water slides with toboggans will give you hours of fun. The campsite benefits from walking and cycling paths to the beach and forest and you will discover plenty to do in the nearby town of St Jean de Monts. Evening entertainment on site includes regular disco nights. When you fancy a day out, there are plenty of activities in the surrounding area to ensure that everyone goes home with happy holiday memories. There are several local equestrian centres where riders of all abilities can enjoy riding through the forests, along the beach and into the sea. Climb through the treetops and descend on zip-wires at the Explora forest park or explore the colourful open market at St Jean. 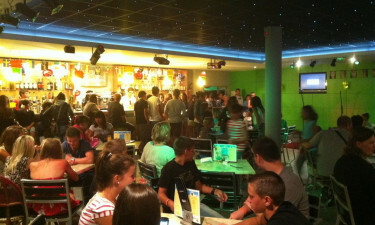 Try your luck at the local casino, play mini-golf or simply relax, enjoy a drink at a cafe and watch the world go by. To make your luxury camping even more relaxing, the campsite bar and restaurant is open daily and serves favourites such as grills, seafood, salads and pizzas to eat on the shady terrace or to take away. 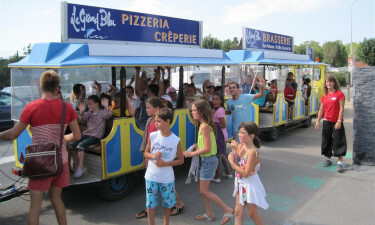 You will also find many restaurants serving fresh seafood and local specialities in St Jean de Monts. You can stock up without needing to leave the campsite at the onsite supermarket, where you can buy fresh bread baked daily, fruit and vegetables, milk, convenience foods and toiletries. There is also a village shop within easy walking distance and at St Jean you will discover a good range of shops as well as a lively covered market.